There are no limits to the interior dialogue of the soul with itself. With this thesis, I would oppose the suspicion that language is an ideology. In her own written statement on The Chinese Version paintings, Jia (b. Beijing, 1979) leaves no doubt that the series arises from her outrage over an enduring act of cultural degradation. In this regard, it is useful to recall that ideological destruction of culture recurs in history in accordance with patterns that foreshadow even more terrible events. In the case of the Chinese Character Simplification Program of 1955-1957—whose linguistic modifications remain in effect in China with the force of law—not only did it pave the way for the Cultural Revolution (1966-1976), most likely it was a necessary precondition for it. As such, it was both a first phase and a vehicle for an even more general destruction of Chinese culture, the most extreme since the famous anti-Confucian “Burn books, bury scholars” edict of the First Qin Emperor in the third century B.C. As atrocities against humanity continue with such frequency, we often hesitate to respond to atrocities against culture, even though it is through culture that we define our humanity. And programmatic killing, presupposes that murderers relinquish genuine culture in order to realize themselves in action. The regime identifies cultural elements and institutions that it regards as inconsistent with its aims. This presupposes the establishment of a bureaucracy for the political evaluation of cultural production. Any aesthetic evaluation is subordinated to the political. The regime proscribes such works—this follows government monopolization of the means of cultural dissemination—and enforces its proscription by means of its police apparatus. Depending on an ensemble of conditions that find their industrial analogy in the field of cost-benefit analysis, the regime may take the additional steps of arresting, torturing, imprisoning, and / or murdering the authors and disseminators of alternative cultural production, even if their work predated the new regime, and even if their activities have ceased. Now to the distinction implied by Jia’s statement: only one leader conceived and implemented an anti-culture program so ambitious that he not only proscribed unofficial cultural production and persecuted its authors—which he also did on a grand scale10 — but he also succeeded in imposing severe limitations on the very capacity of language to express ideas inimical to his political program. By extension, to the degree that our thoughts only may be fully formed insofar as we can express them in language, he also limited the ability of his people to precisely formulate certain thoughts. 11 This leader who so distinguished himself in this regard from his senior contemporaries in Germany and the Soviet Union, was none other than Mao Zedong. 12 And the means he invented in order to achieve this goal was the Chinese Character Simplification Program, a mandate enforced by policy that remains in effect in the People’s Republic to this day. Chinese characters retain such a specific visual aspect that, strictly speaking, it is not necessary to be literate in Chinese for the reader to have a sense of the formal aspects of the changes the program has wrought—even if the formal changes were only the first phase of a broader plan. In treating the formal aspect, my somewhat arbitrary examples that follow perhaps are as useful as any for this purpose—clearly, traditional versions are to the left; simplified, to the right. Leaving aside the matter of how these characters might appear were they to be written with a brush by an artistic calligrapher, prima facie it would seem that the first simplified character above ye 业 —no matter how aesthetically banal the simplified version might be by comparison to its source—at least would have the utilitarian advantage of being easier to read, write, and memorize merely for the fact of it having fewer strokes. Much potential confusion arises from the fact that those who devised the formal simplifications did so by resorting only to formal criteria, without any regard for conflicts of associated meanings in the character constituents they chose. The third example above is a case in point. For the simplified character 讲 rang (to allow), the simplifiers effectively preserved the left part of the traditional character 講, the word radical 言—which itself comprises the roughly square pictogram for mouth, and which often connotes an association with speech. Here, they simply amalgamated its strokes, rather like a version quickly scribbled in cursive—this part of it is uncontroversial. But for the constituent on the right hand side of the character, they eliminated the lower portion, and took an existing character that resembles but does not duplicate the upper portion of the combination. But since they only chose the upper portion on formal grounds without regard for its existing stand-alone meaning (including its history as a pictographic etymon) they end up using the character 井 (jing) which every Chinese school child knows means well (in the sense of a drinking well), even though this meaning has absolutely nothing to do with the any semantic association of the resulting simplified version of rang 讲 (to allow). Whatever the program’s stated raison d’être, its transparent effect was to destroy the ability of those who were learning to read under the new system, to comprehend any texts except those approved by the Chinese government’s General Administration of Press and Publication (GAPP) 新闻出版总署 (xin wen chu ban zong shu), and its corresponding Party organization, the Central Propaganda Department (CPD) 中共中央宣传部 (zhong gong zhong yang xuan chuan bu). As these “reforms” took hold, it is perhaps no coincidence that Mao was able to launch the Cultural Revolution ten years later, when those who had been raised under the new writing system already had grown to late adolescence and early adulthood, and had been schooled with a language appropriate for their entry into the ranks of the Red Guards. The distinctive aesthetic potential of Chinese calligraphy derives from the nature of the Chinese character itself, a uniqueness that resides, in large measure, in that traditional characters are, for the most part, pictographic and / or ideographic, and comprise their own etymologies. Poets, for example, often wrote their works in a calligraphic style that formally could imitate the thematic content or mood of each poem; and the overall compositional layout on the paper also could have corresponding resonances in the structure of the text. This is not merely a matter that a poem of mourning could be written with a thick, heavy stroke, and a poem about dancing the sword mime with a thin stroke in a rapid cursive style that conveyed the speed of the dance. Artists often expressed the aesthetics of this integration between the formal, semantic, and structural elements of a text by means of the stroke order of characters that also determine transitions from one character to the next. One measure of virtuosity was the degree to which a calligrapher intentionally violated conventional stroke order so as to heighten expressive abstraction through the degree of cursiveness, and the deftness of transition. Artists also employed intentional inconsistencies of scale from one character to the next, in the service of overall composition, evoking a “push-pull” sense of oscillating orthogonal perspective and, ideally, they achieved the synthesis of form and semantic content aforementioned. These and other aesthetic criteria that continued to evolve at least since since the Chinese invention of paper in A.D. 105 abruptly stopped with character simplification, which simultaneously curtailed the richness of vocabulary that accompanied and nourished the form. It is possible, of course, to execute a calligraphic work with simplified characters—Mao’s own calligraphy is replicated in stone inscriptions throughout China. But divorced from its artistic specificity, the inevitable result of such calligraphy is a pale reflection of the medium’s potential, often to the point of travesty. Imposed simplification also entails a concurrent loss of the culture of mastery and development of the aesthetics of the calligraphic medium. Chinese characters are semantic signifiers. In this respect, they serve a function analogous to written or printed words in any language, as units of meaning that can form grammatical syntactic sequences— despite that they do not represent sounds even though they have sounds associated with them. Unlike letters or characters of syllabaries, [traditional] Chinese characters are also image-signs, with varying degrees of pictographic or ideographic content that visually conveys meaning that comprises their own etymology. In the sense that they can, at times, visually convey multiple meanings, they may also be symbols. The arrangements of characters in the paintings of The Chinese Version18 occur entirely on the basis of formal criteria—not semantic criteria. Each character therefore may retain its individual meaning, but not as a syntagm in sequential relation to other syntactic or grammatical units that could form a phrase or sentence. This artistic strategy simultaneously achieves several aims. First, it invests the characters with a formal aspect to “replace” that which was mutilated by the state’s program of formal character simplification imposed for propagandistic ends. The paintings evince this new formal aspect in a way that is not based on traditional calligraphy, but which is entirely contrived by the artist through juxtaposition and de-semanticization of the characters’ syntactic relations. Ironically, the artist achieves this while appearing to imitate the outward aspect of printed characters, thereby implicitly turning the pretext of simplification for the sake of efficiency against itself. Despite their printed appearance, the artist laboriously paints the works by hand, thereby evoking a tension between their outward aspect and the manner of their execution that is consistent with their overall conceptual program. Second, the artist’s arrangements juxtapose simplified characters with the “lost” characters from among the two-thirds of characters excluded by official general publication guidelines. By their very presence in these paintings, these characters constitute further repudiation of a policy of cultural degradation. As the artist’s text implies, to say that these formal arrangements are without internal semantic relations is not to say that they are without meaning. As ensembles, the arrangements in their formal aspects generate collective arrays that simultaneously operate as image-signs (e.g. as dynamic patterns of waves or other movements along x or y axes); or, in their conceptual aspect, as symbols of opposition to imposed linguistic and cultural degradation in the service of ideology. Just as literacy in Chinese is not strictly necessary in order to perceive the implications of these works, neither is their critique of state-mandated cultural degradation necessarily limited to a Chinese condition. 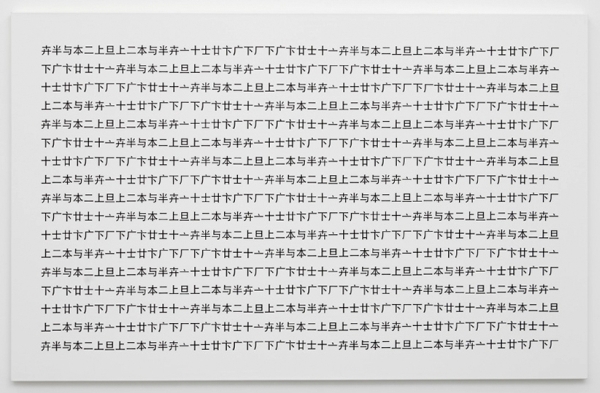 Through artistic means, The Chinese Version paintings render sentences relational. The truth is in the picture. The immense literature on this subject in Chinese and Western languages is listed online under the Oxford Bibliographies heading Revolutionary Literature Under Mao.